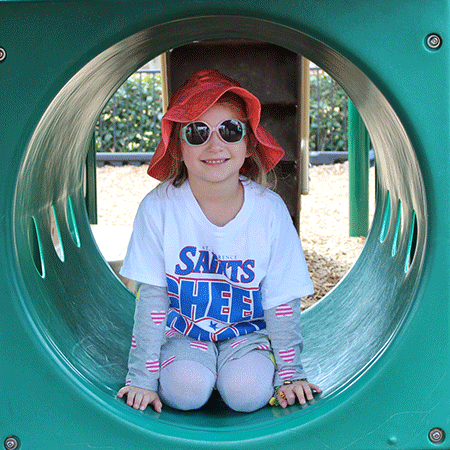 Help students be sun safe during outdoor play on playgrounds or during field trips by using the Sunbeatables® sun safety superpowers. Ask students to cover up, use sunscreen and lip balm with SPF 30, find shade, and be SUPER-protected when shadows are shorter. Make sunscreen application easier for you and fun for your students. Model sunscreen application and encourage students to rub sunscreen on their own skin. Apply sunscreen while students are singing one of the Sun Safety Songs provided with the curriculum. To maintain sunscreen’s effectiveness, sunscreen will need to be reapplied before students go outside each additional time during the day. Shadows are longer during early morning and late afternoon. During the midday hours (10:00 AM to 4:00 PM), the sun is directly overhead and shadows are shorter (or there is no shadow). Sunburn-causing UV rays are more intense and harmful at this time. For more information about UV rays, please refer to the Resources section at the end of this guide.